What are the important problems that Spring Framework solves? How does Spring Framework make building enterprise applications easier? What are important features of Spring Framework? What are important concepts to understand in Spring Framework? Why Is The Spring Framework Important? What are the best practices in using Spring Framework? The Spring framework provides comprehensive infrastructural support to develop Java applications. Spring handles the infrastructure, so you can develop your application. 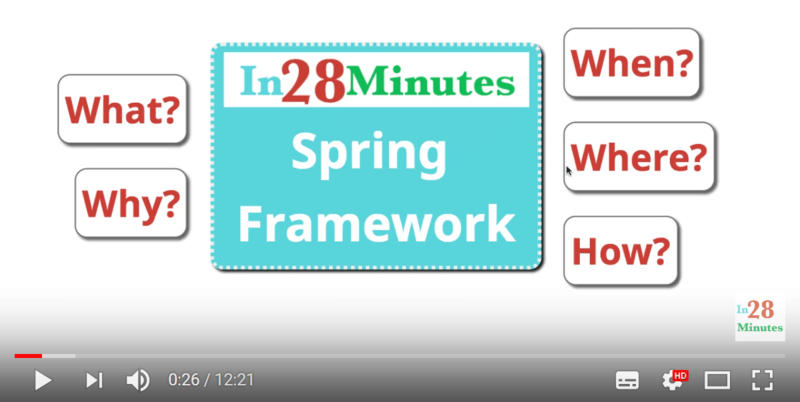 Let’s look at some of the important features of Spring framework with examples. When we write application code, we don’t want it to be tightly coupled. ComplexAlgorithmImpl is tightly coupled to the BubbleSortAlgorithm. If you need to change the sort algorithm from BubbleSortAlgorithm to QuickSortAlgorithm, then the code of ComplexAlgorithmImpl needs to change as well. ComplexAlgorithmImpl is no longer tightly coupled to any particular sort algorithm. The exact sort algorithm to be used can be passed as an input parameter to the constructor. What does the Spring Framework do? Where does the Spring framework come into the picture? We defined the components and identified their dependencies by using Spring specific annotations. We are defining ComplexAlgorithmImpl as a spring bean, and SortAlgorithm as a dependency. We are also providing an implementation of SortAlgorithm - QuickSortAlgorithm as a spring bean. When Spring Framework looks at this code, it create a QuickSortAlgorithm bean and injects it into ComplexAlgorithmImpl bean. This is called Dependency Injection. If you want to switch to a new SortAlgorithm implementation, then loose coupling makes it very easy to make the change. The code inside ComplexAlgorithmImpl does not need to change at all. You need to remove the @Component annotation from QuickSortAlgorithm and place it at the definition of the new implementation. The other thing you are now able to do is write a unit test for ComplexAlgorithmImpl, without worrying about the sort logic. You can create a stub algorithm that implements SortAlgorithm, and use that in tests for ComplexAlgorithmImpl. The test would now focus on the business logic of the component, not its dependencies. The WelcomeController is directly creating an instance of the WelcomeService, and so it is tightly coupled to it. Now, Spring auto-wires in the WelcomeService dependency to the WelcomeController component. When writing a unit test for this component, we can use a WelcomeService stub instead of an actual dependency. The Spring framework can be used to solve a host of other problems in Java applications. Let’s look at a few of them. All these frameworks make it easy to write your Java code. They bring in a set of abstractions, that reduce boilerplate code. Allows the programmers to focus on the business logic. The key feature is dependency management, and it provides excellent interfacing with external frameworks, by adding layers on top of them. Enables testability, as it enables us to write decoupled code. Allows for inversion of control, through dependency injection. A component is no longer tied to specific dependencies. Instead, the dependency is injected in from outside, during instantiation of the component. The Spring framework takes care of the actual injection. You only need to provide the Group Id, the Artifact Id, and the framework dependencies of the project. After that, you can generate the project and get started with Spring. Spring Boot makes it very easy to use the Spring framework. Always make sure you write great unit tests, because Spring makes it easy for you. Spring is difficult for a starting programmer to understand. However, once you understand it, you cannot stop using it! There are a wide variety of projects that have been done, under the umbrella of the Spring Framework. Popular ones include Spring Cloud, and Spring Web Services. In this article, we had an introductory look at the Spring Framework. We saw that Spring is a Java framework that makes life easy for a programmer. Spring improves the testability of the application code, and also makes it easy to interface it with external frameworks. Spring comes with its own umbrella of projects, and a rich set of modules as well.